1400 start time on Sunday (Nov 3rd) so arrive by 1330!! Plan for at least an hour to travel there! By Public Transportation: Take Blue Line 4 to Suyu Station (# 414)(600 won). Leave Subway by Exit 7 and stop at the top of the stairs to catch bus # 16-1 (350 won). Try to sit on the right side! The bus will make two right turns, the second right turn will be onto route 41. You will then ride through two major intersections. After the second major intersection (look for "Academy House" sign on the left), push the button to get off at the next bus stop. You'll either get off before the Burger King or right in front of it. Either way, continue walking up the road until you find Burger King and then cross the main street to the park behind the white wall. 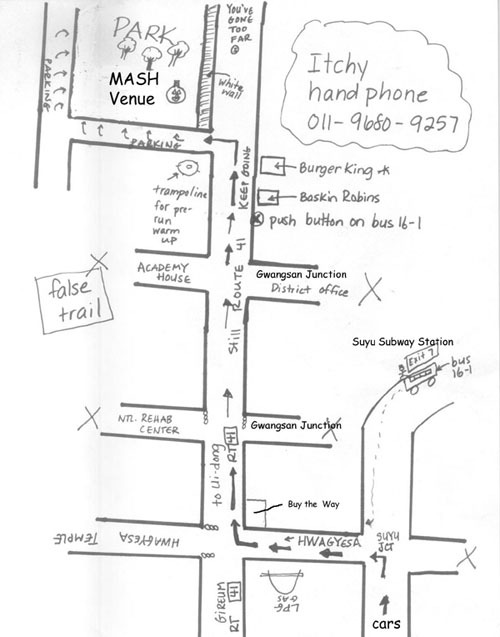 Find your way inside and look for the MASH venue! Once located, get ready to hash! - Follow Route 21 North from Dongdaemun (direction: Mia Junction/Marigogae). - Use the overpass at Mia Junction and continue on Route 21 (direction: Suyu Junction). - Turn left at Suyu Junction on Route 215/Hwagyesa-gil (direction: Hwaghesa Temple). - Turn right at the first major intersection onto route 41 (direction: Ui-dong). - You will drive approx 3 km (through two major intersections). Look for "Academy House" sign on the left side as you pass through the second major intersection. - When you see the Burger King on your right, get ready to turn left. After passing the Burger King, turn left (next to the trampolines). You will then be at the south side of the park, which is enclosed by a white wall. - Park anywhere you can find next to the white wall and find your way inside! Get ready to MASH! Call 011-9680-9257 if you get lost. There will be snacks aferwards and everyone is encouraged to bring something to share for a post-hash picnic/BBQ. There will be at least one small grill.